With a Victini-themed sweepstakes, the limited theatrical release of Pokémon the Movie: White-Victini and Zekrom, and a special December distribution event, players will be hard-pressed to elude the victory Pokémon this holiday, not that they'd want to. The Pokémon Company International is leading Victini's victory lap this holiday, starting with the V for Victini Sweepstakes, in which players can enter for a chance to win V for Victini Pokémon Card tins, plushies, or the grand prize package of a Flame-Red 3DS, a copy of both Pokémon Black and White, and a whole bunch of booster packs for the collectible card game. 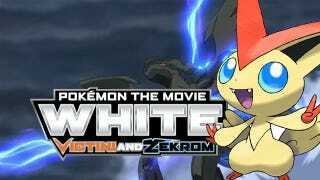 That excitement leads to an extremely limited North American theatrical showing of Pokémon the Movie: White-Victini and Zekrom, an animated epic featuring everyone's favorite v-headed little freak. The film will only be shown at sele3ct theaters December 3 and 4, so sign up at the movie site to see if there's a theater near you. Capping of the Victini celebration is a special distribution event, giving Pokémon Black and White players a chance to score a Victini of their very own via Nintendo Wi-Fi Connection service, complete with a set of powerful moves to be announced at a later date. Intriguing! Just connect your copy of the game to the net between December 4 and 31 and victory shall be yours.